Paintball is rated by the Insurance Industry as one of the safest sports played as long as it is played at a Regulated Supervised Safety Trained field. 97% of all serious paintball injuries happen in backyard or unsupervised situations. Since it began in 1981, the sport of Paintball has grown to become recognized as one of the World’s most Exciting Outdoor Participation Sports which is enjoyed by all ages ranging from 10 years old to 70 plus. Paintball is played in over 40 countries by millions of men and women of all ages and lifestyles. Paintball truly crosses all levels of society and brings people together from all backgrounds into a truly enjoyable game. Whether a housewife or high school student, a professional or a retiree, all Paintball players share a common love for a true adventure in an adrenaline packed atmosphere. 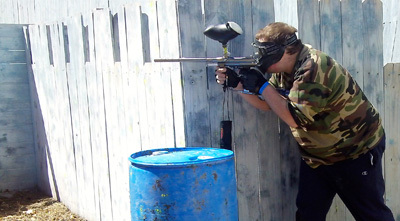 Most players use a semi-auto paintball marker that shoots a paintball every time that they pull the trigger. EMR rents the high quality TIPPMANN semi-auto markers for the new player’s use. The rental also includes all the necessary CO2 to power the marker and a set of safety approved goggles attached to a full face mask that covers the face, chin, ears, and of course your eyes. All markers come with a barrel cover that slides over the end of the marker barrel for when the marker is not in use so you cannot accidently shoot a paintball out of the marker. All private groups are run by Safety Trained Refs and you will be given a thorough safety briefing before you start playing. The same applies to Big Games and Scenario games. Markers range from simple to sophisticated, but what they all share in common is a limitation on their power and range. The international safety limit on the speed (measured in feet per second, “FPS”) at which a marker shoots a paintball is 300 fps. A chronograph is used to test for speed limits, and all markers can be adjusted to shoot under the speed limit. A marker’s range is limited too; even shooting at 300 fps at maximum elevation with the barrel pointed up into the air, a marker can lob a paintball only about 50 yards. At EMR, we set our speed at 285 FPS to allow a safety margin of 15 FPS for velocity spikes due to weather, different equipment, or faulty regulators. The most basic GAME consists of two teams trying to eliminate the other team members by marking them with paintballs while striving to Capture the Flag and bring it to their base. This format combines the childhood games of “Tag” and “Hide & Seek”. EMR is proud to provide many different styles of playing fields to run the games on such as the full size two story CASTLE AAARRGH, CASTLE WAR, TIPPMANN TOWN which is full of one and two story buildings, wooded fields, speedball fields, and many other choices. We also run a variety of different styles of games besides Capture the Flag for our private groups and run many large events that have multiple objectives such as our CASTLE CONQUEST Big Game and EMR’s own Hybrid Scenario Games of which you can check out by viewing our schedule of events. Our Paintball facility is run in a very relaxed but safe atmosphere that offers breaks between games to check your equipment, get more paintballs, or have a snack or beverage while sharing exciting stories of the thrills of victory and the agony of defeat, all in good fun. Players should wear old clothes, preferably loose for ease in running and moving. 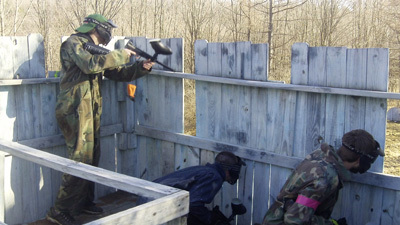 Most players like to wear long sleeve shirts and long pants for protection of the arms and legs against scratches and paintball hits. EMR does rent Camo Overalls for those who would like them for $5 for the day. Players should also wear comfortable shoes or boots that are good for running and moving about. Something with ankle support is good as there is a wide variety of terrain at EMR that you will play on running from flat fields to trench systems to woods. A baseball style cap turned backwards or head cover is preferred by many players to cover the top of the head. The average new player in a private group will shoot approximately 500 to 1000 paintballs for the day. In Big Games or Scenario games, the average new player will shoot approximately 1000 paintballs per day of play. Pricing of Paintballs is listed on our pricing page. Players should also bring food and beverages to consume during the day or you can buy them at EMR from our store. We stock Sodas, Water, Sports Drinks, Candy Bars, Snacks, and Hot Pockets and sandwiches. There are many restaurants and pizza places within a few miles of EMR. We also offer overnight lodging in our bunkhouses for players that want to stay overnight. If staying overnight, players should bring a sleeping bag, pillow, air mattress, flashlight, and any other conveniences that they wish. We also have a camping area if you wish to pitch a tent or park an RV. EMR has a Rec. Center with a Ping Pong Table Foosball table, TV, tables and chairs. We also have two Fishing Ponds, a Volleyball Court, Horseshoes, and a Bon Fire Pit. 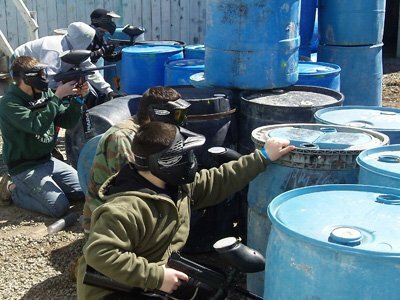 If after reading through our web page, you have any questions about PAINTBALL or playing at EMR, please call us at (570) 465-9622 or contact us and we will be happy to answer them. Paintball is a character-building sport. Players learn about teamwork, gain self-confidence and develop leadership abilities while having fun and getting welcome stress-relief. 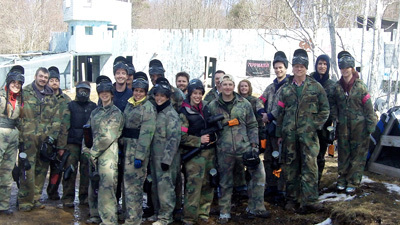 Increasingly, corporations are finding the benefits of having their staff and management participate in paintball games.